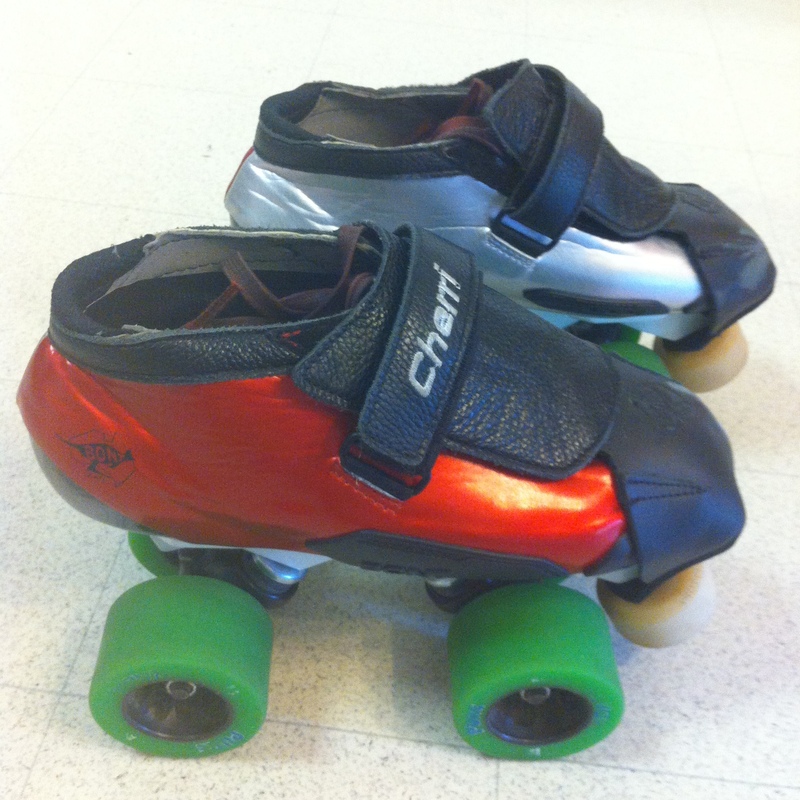 Bont semi-custom hybrids, closed toe, bumpers, metallic red and silver durolite skin with black leather lace cover and tongue. 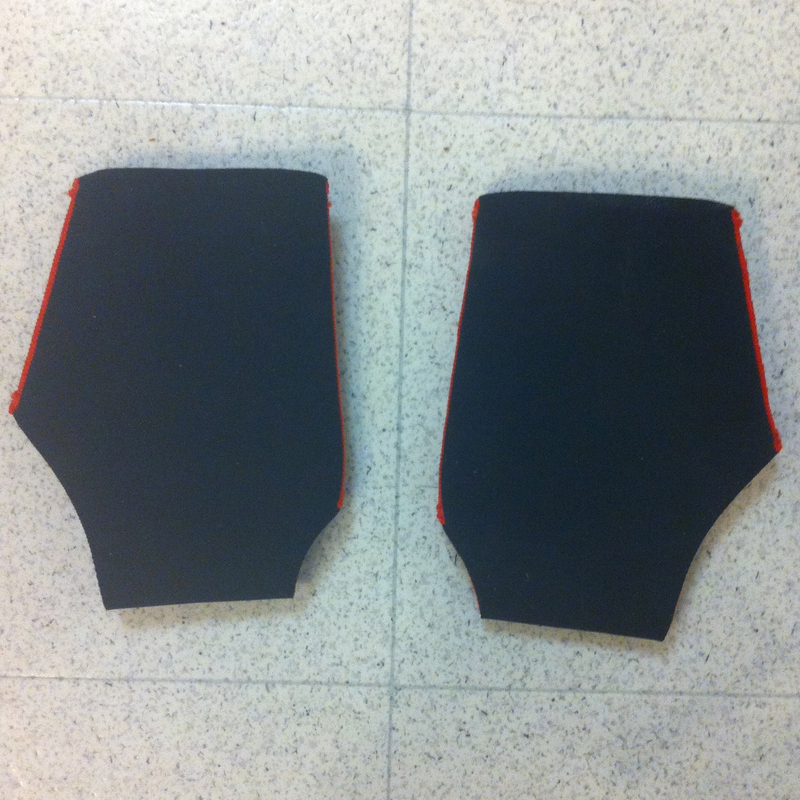 Size 1 Avenger plates. The slipper-feel of perfectly fitting skates can elevate your play by allowing you to become hyper-responsive. The absence of your feet shifting in your skates allows you to move and react without compensating for slippage in the boot, compared to when your skates don’t fit perfectly. The more control you have over your boot, the more control you have over your edges, which makes you a more responsive skater. Finding that perfect boot to fit the unique shape of your foot can be challenging. Once you find that perfect pair, the fit may still require some tweaking. That’s what I found when I received my semi-custom skates this spring. Ordered in two different sizes to compensate for the half-size difference in my feet, I found the length in my larger right foot was perfect, but the right heel cup was also larger and didn’t quite fit my heel compared to my smaller left skate. Because my skates were semi-custom, I was unable to return them. I had to find a solution. I use the sport inserts for my skates. 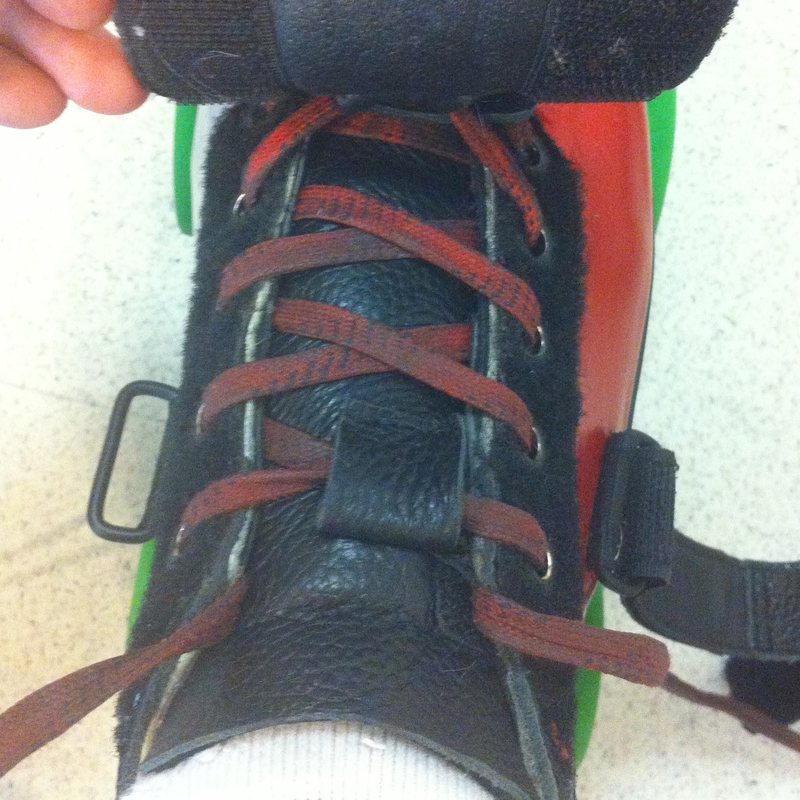 Lifting your heel in the skate can eliminate heel slip in your boot. Before I tried my own modifications to the boot, I contacted my boot manufacturer rep to make sure I did the heat molding process correctly. TIP: always contact the boot manufacturer or where you purchased your skates first if you are having issues. They will have the best and most up-to-date information for you. She confirmed that heat molds could not get the heel tighter and recommended I fill with padding around the heel. In my search for options to tighten the heel of my skate, I found a thread on Skate Log Forum that gives several suggestions to make your skates fit better. I highly recommend you check out all the advice and resources on the thread if you are having the same issues. One of the suggestions, according to poster ‘okie,’ is to raise up your heel to help lock it in place. Okie suggests to add a pad in the heel under your liner. This forces the heel up into the upper cup area of the boot and can sometimes fix this problem. Neoprene booties. Very comfortable to wear. Highly recommended. I already use sport inserts which lifts my heel so I decided to look for the next idea. Posters ‘graphixgurl’, ‘KMA’ and others suggested neoprene booties. 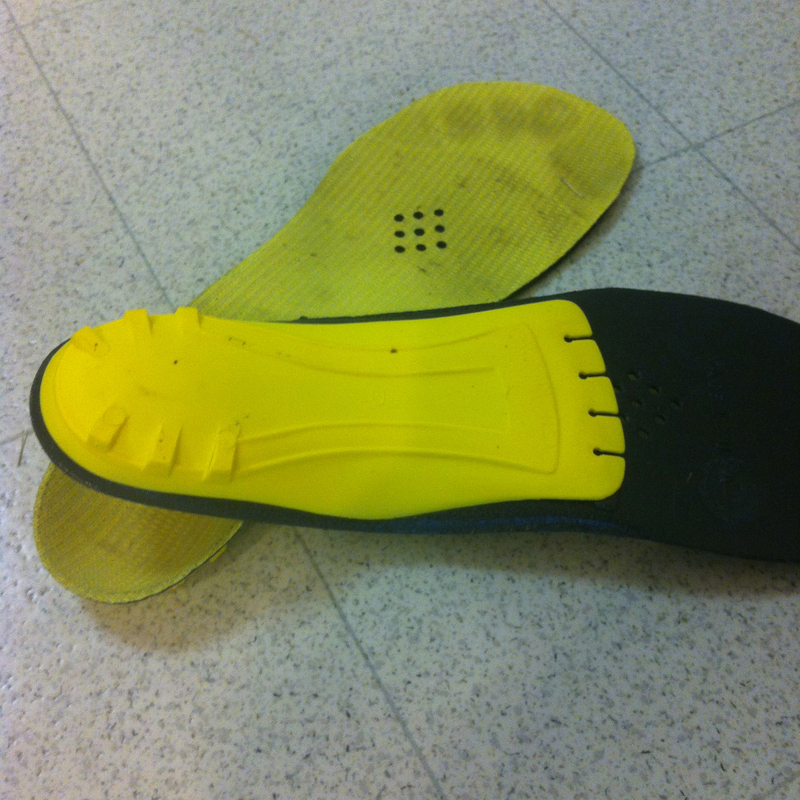 Their thickness helps your heel stay in the boot and grips it to the inside of the skate. There are several thicknesses to choose from, depending on the kind of fit you are looking for. After trying a pair, I’m kicking myself for not making these booties part of my regular footwear sooner, though they can make your feet a little hot. I love how these feel in my skates, but I still wanted a bit more of a custom interior fit. 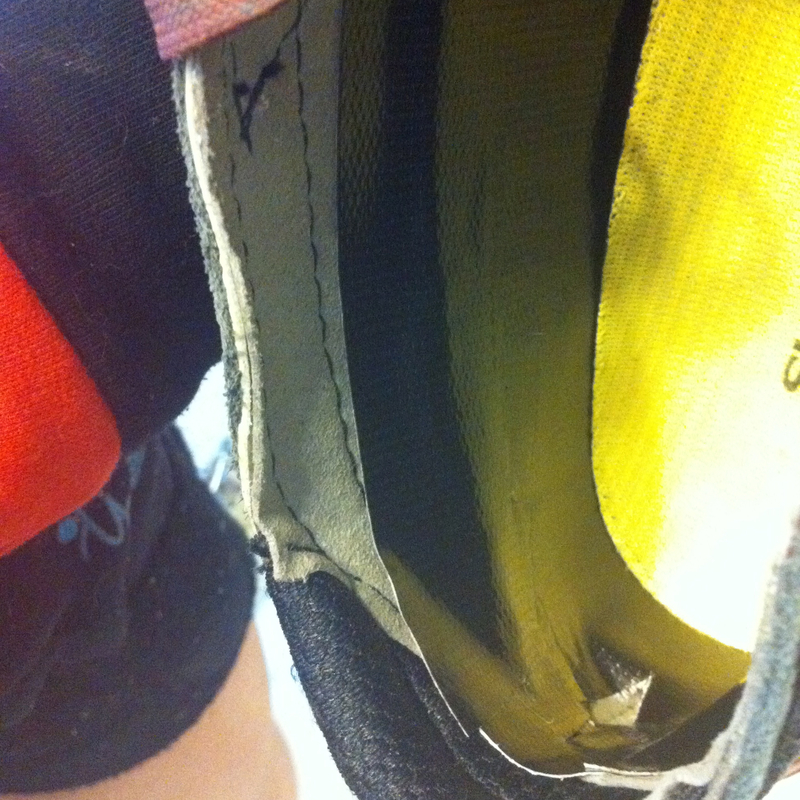 Going back to okie’s forum post, he also suggests using Gorilla Tape in layers on the heel cup to customize your fit. I figured I give it a try. Below is my ‘how to.’ Click on thumbnail photos for larger photo. (Opens in new window). Skates with laces and insoles removed. 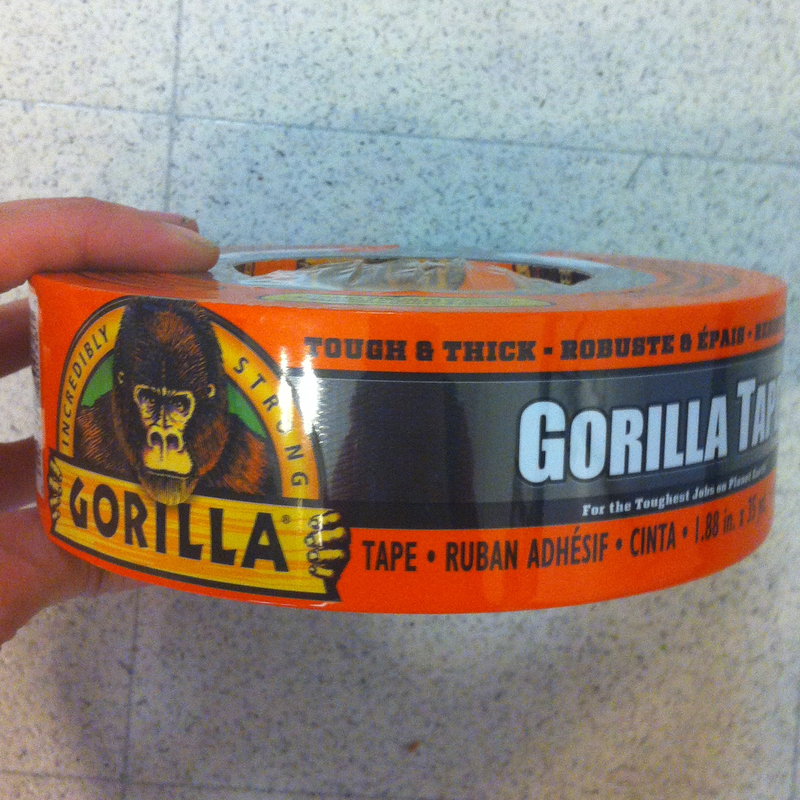 According to okie, Gorilla Tape is a good choice for this project because it is thicker than duct tape, is cloth-backed, the glue does not come off with moisture or movement and it sticks to itself. You can find it at major hardware stores, usually in the paint aisle with the other adhesives. Step one: Determine the areas that need a bit more interior support. The plan: Put tape along the sides of the skate, but not the back of the heel. The length of my skate was perfect. 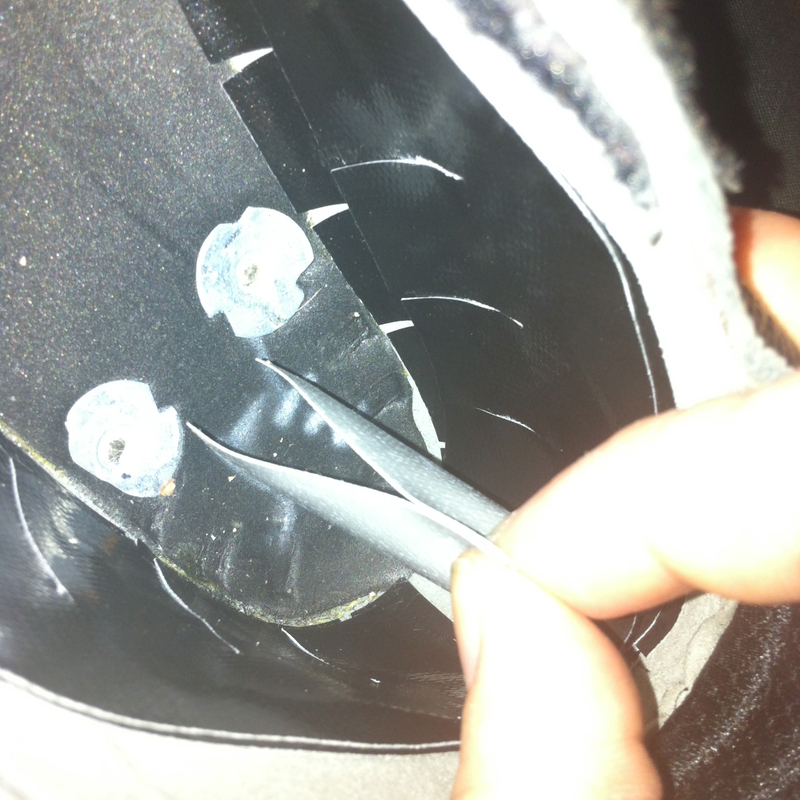 Therefore, I decided to put tape along the sides, not the back of the skate, to tighten the heel cup. I chose to make the lengths long and place them just off-centre from the back of the heel to just before the ball of my foot. 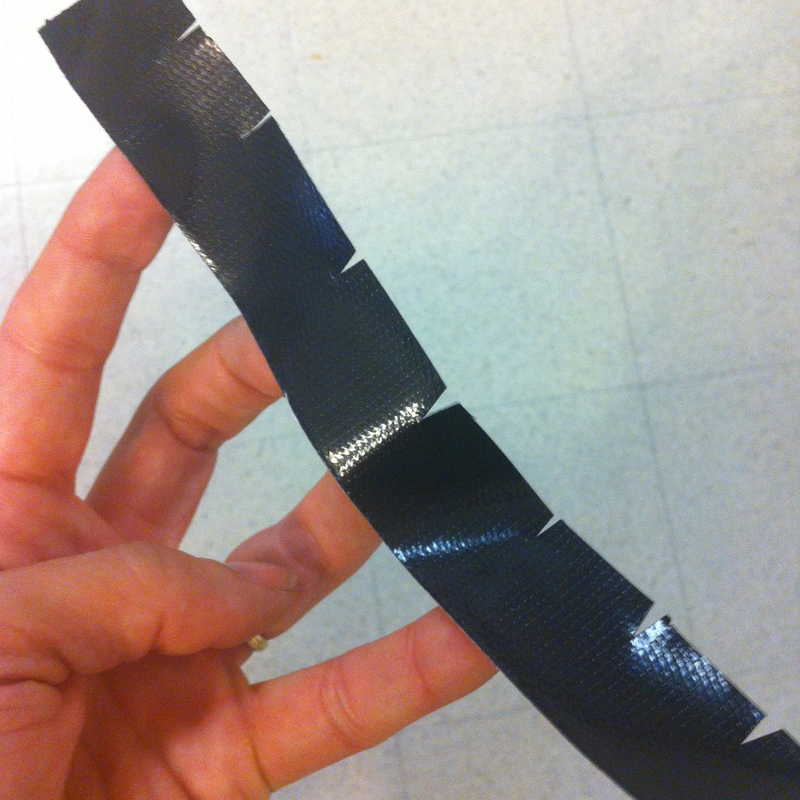 By ‘feathering’ out the tape, my hope was I wouldn’t feel odd shape transitions within my skate. To avoid wrinkles in your tape as you mold it around curves and corners, notch it at various intervals on one side. I decided to start with one layer of tape cut lengthwise, then I used the full width. Considering how grippy this tape product is, it was surprisingly easy to work with. Pulling up the tape was a breeze if I didn’t position it quite where I liked it. Step three: Layer tape in problem areas. You can see the layers starting to build. Be sure to try on your skates after every layer. I started layering with pieces cut lengthwise, then moved up to full width pieces. After each layer, I laced up my skates and jumped around in them to test how they felt. I did this until I had no heel slippage. It didn’t take long for me to start feeling the difference. This tape is much thicker compared to duct tape. Keep adding until you are happy with the fit. Step four: Finish the edges. Putting a layer on top of the tape edges keeps it from from getting caught on your foot. There is potential for your heel to catch the edge of your layered work if you have several layers. I finished the job with a layer over the top edge of the tape to give it a smooth finish. 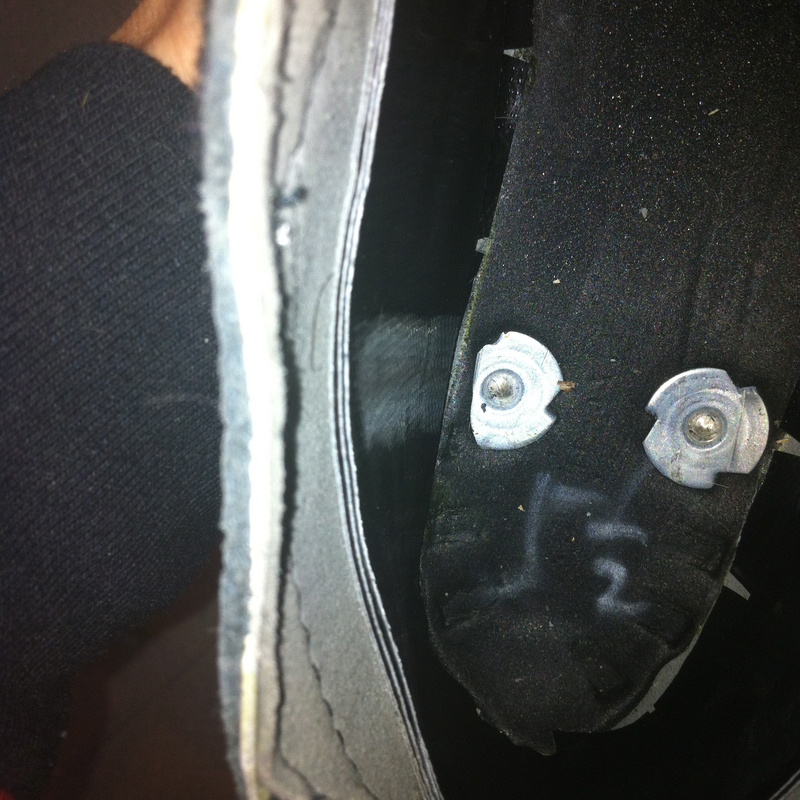 I also put a single piece at the back of the heel to cover the ends of the tape going down the side of my skate. Folding the tape before positioning makes it easier to work with. Positioning the tape: Fold tape in half, sticky side out when inserting it into the boot. Position the middle section onto the boot, unfold the tape and press down to the ends. Wrinkles: If you feel a wrinkle forming on your layer, pull up the tape and cut a notch where the wrinkle happened to allow for space for the tape to mold around the boot. Don’t allow any wrinkles in your tape job. Using the notches: In the photo on the right you can see how the notched tape looks when it’s sitting in the boot. Put the notch-side of the tape on the side that has the most need to be flexible. For example, on the inside edge of the boot, I put the tape on notch-down so it would easily bend around the instep area. On the outside edge of the boot, I placed the tape notch-up because the upper area of the boot had more curves to work around. Hopefully this helps some of you who have skates that aren’t quite perfect. Do you have other techniques to customize your skates for better fit? Please feel free to post below. Also, see my post with a great link to lacing techniques that may solve some of your fit issues. 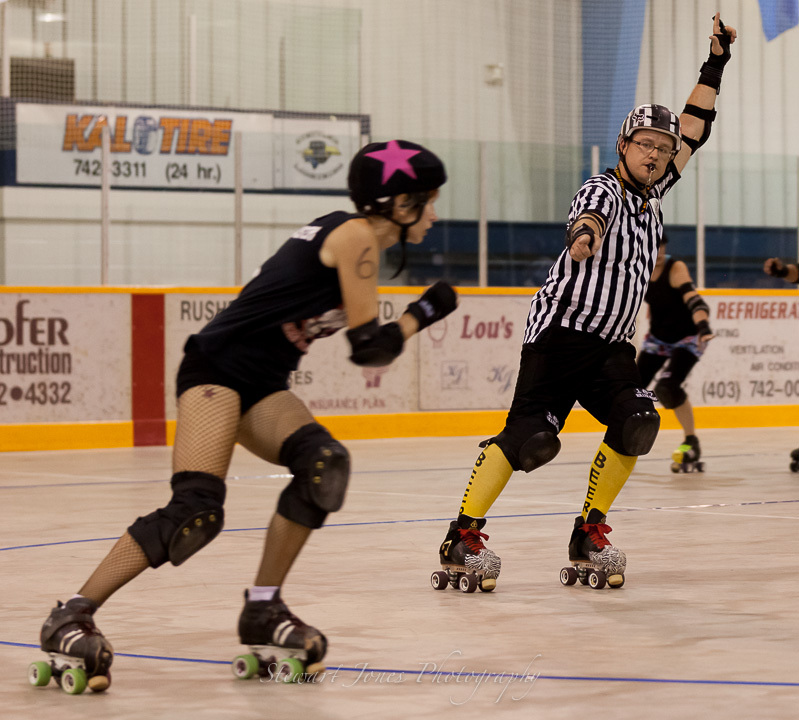 Check out this amazing website on all the different ways you could lace your roller skates. Right now I use the display shoe lacing approach. But I’m interested in trying the lock lacing approach to help with my heel slip issues. Here is an alternative heel lock method used on running shoes. 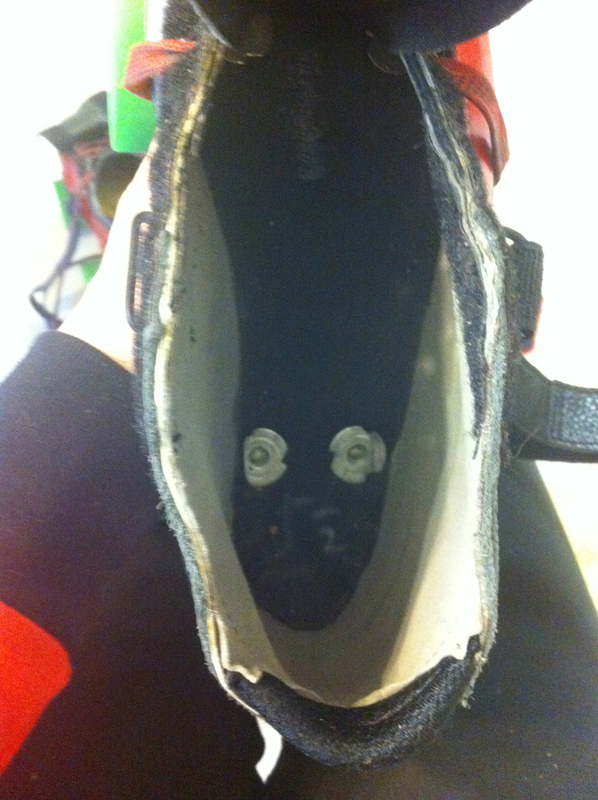 But if your skates have the appropriate holes, you can try it too!